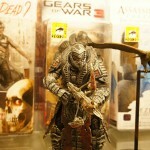 Here’s photos of NECA’s various Video Game toys on display from San Diego Comic-Con. Included are Left 4 Dead, Half Life, Portal, Gears of War, Duke Nukem, Bioshock and Assassin’s Creed. 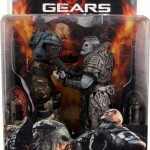 Neca has put up two new Gears of War 2 listing, with photos, on their website. Each figure in the set comes with new arms with improved articulation, and interchangeable heads and helmets, so you can customize your own Locust Horde! New Head Sculpts exclusive to this set include the Locust Bolter and the Sniper Helmet from Gears of War 2. Also included in the Boxed Set is a full arsenal of weapons that can peg to the figures’ backs, including: Longshot Sniper Rifle, Hammerbust Assault Rifle, Hammerburst 2.0 Assault Rifle, Lancer Assault Rifle, Gnasher Shotgun and Boltok Pistols. Humanity strikes back against the nightmarish Locust Horde with a plan to detonate a Lightmass bomb in the subterranean Horde stronghold. The bomb requires targeting data from a series of deployed resonators, and unfortunately one has gone missing. Lieutenant Minh Young Kim and his Delta Squad are sent on a recovery mission but are ambushed near the House of Sovereigns. Separated from his squad by a helicopter crash, Kim comes face-to-face with RAAM, the monstrous and brutal field commander of the Locust. Their encounter ends tragically with Lieutenant Kim impaled upon RAAM’s blade. From the original smash hit games comes two brand new Gears figures. The heroic COG soldier Lt. Kim and the end boss from the original Gears of War, Locust General RAAM. Each Figure stands 7″ tall and is fully poseable. Game-accurate accessories include a Troika, Lancer and Knife. Click the headline of the story to see both Gears of War 2 in package images. Based on the Xbox 360 Video Game! From the original smash hit games comes two brand new Gears of War Figures! 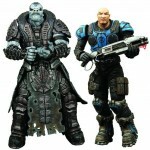 The heroic COG Soldier Lt. Kim and the end boss from Gears of War, Locust General Raam each stand 7″ tall and are fully poseable. Game accurate accessories include Troika, Lancer, and Knife.